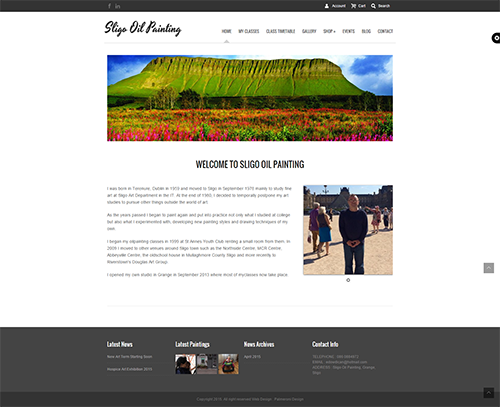 Sligo Oil Painting came to us and asked for a new modern website with a Content management system so they could upload pictures and change the content of the website when required by themselves. Our Web Developer Glen took ownership of this project Liaised with the client and developed the website to requirements to suit the clients Needs which were to have a very easily navigated website, clean and fresh looking , and most importantly mobile friendly. It also had to included Sligo Oil Paintings Classes available and description on the classes, Class timetables for existing members a gallery to highlight some of the very talented students works and of Course Eamonn’s paintings too. It also needed a shop with checkout, cart and a Payment systems so visitors to the Site could buy some of the featured works. and many more features like events , blog etc.